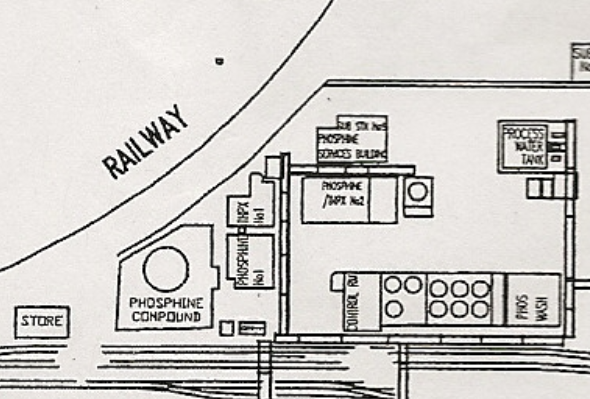 Subsequent to the first phosphine plant being constructed (see picture above) , new European Union legislation made phosphine and the other seriously toxic gas used on site, chlorine more visual. 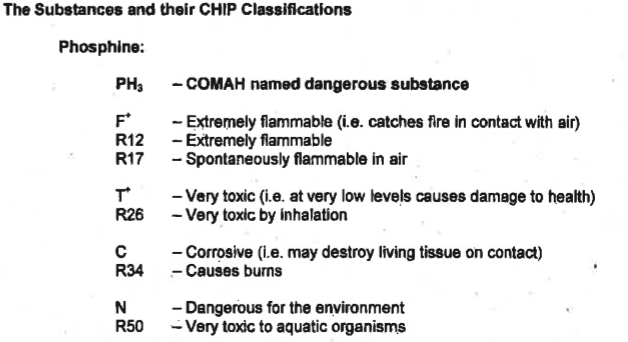 The Control of Major Hazard Regulations 1984 (CIMAH) required the chemical dischargers to advertise their toxic outpourings and advise local residents what they should do in an emergency. It also set a target area likely to be affected by a release of the substances, in this instance set at 1 kilometre from the chlorine storage installation. This was typically used as a PR exercise with Albright and Wilson distributing thousands of leaflets to an audience probably still with living memories of workmen being blown up at the site and also the notorious Oldbury smell– some hollow words of comfort there about health and safety! 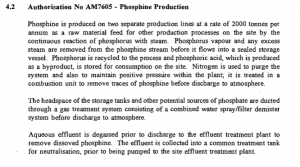 Just ten years after being granted the decision to erect the PH3 facility, Albright and Wilson once again applied for permission to construct another new plant to make the same chemical. 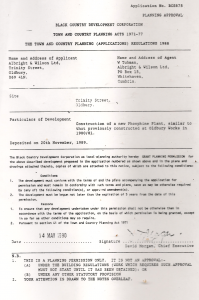 Around 1990, it is clear that considerable changes were being made across the sprawling site, and that these multiple planning applications were causing the local authority some concern about potential safety issues arising from this. 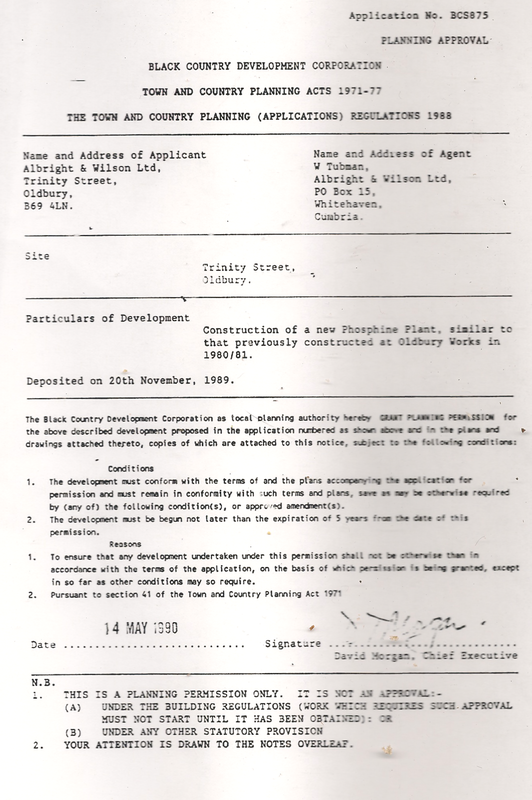 It was felt best to defer the application until the grand plan had been obtained. 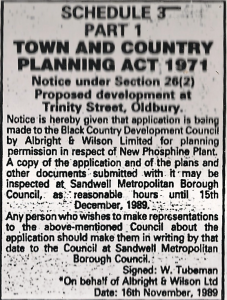 The application advertisement appeared in the Express and Star newspaper dated 24th November 1989. 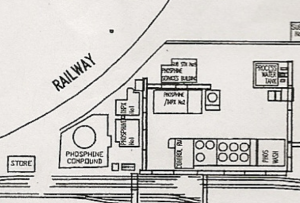 In their assessment HSE considered the likelihood of a major accident at the new phosphine installation and the consequences for people in the vicinity from a release of the toxic and flammable gas”. That’s some improvement to the atmosphere in Oldbury I’m sure! 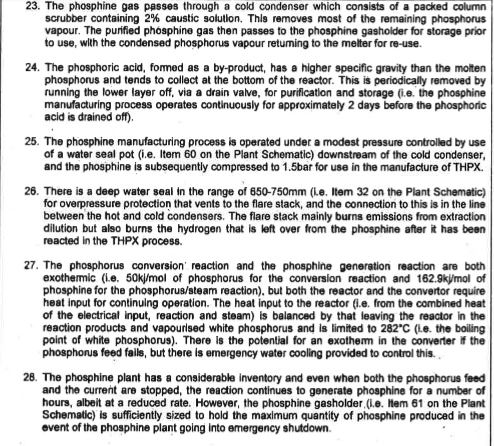 Despite increasing the risk double fold based on the plant being “similar” to the existing phosphine plant, the HSE and the quite useless Woolgar considered it “sufficiently low”. 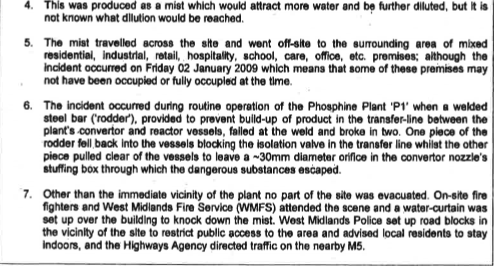 A few years later they were carrying out a major investigation as to WHY and HOW the phosphine number 1 plant had failed in dealing with consequences for people in the vicinity from a release of this same toxic and flammable gas! 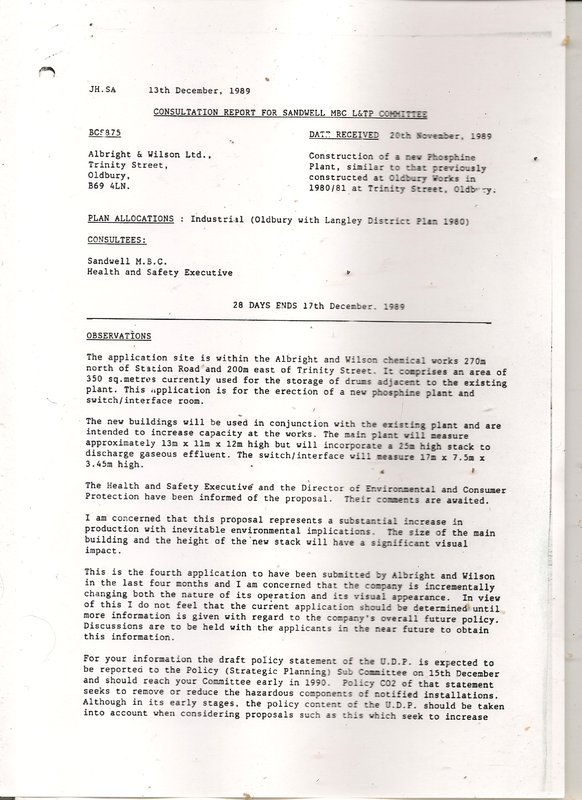 Further new legislation outlined HERE, required Albright and Wilson to apply for storage of the two gases on the site. 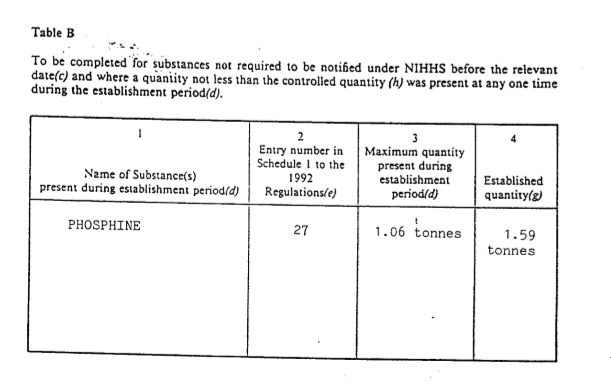 HS/0008 granted in 1992 established the quantity dealt with at the site. The location of the two plants is shown in the area defined by this granted consent. 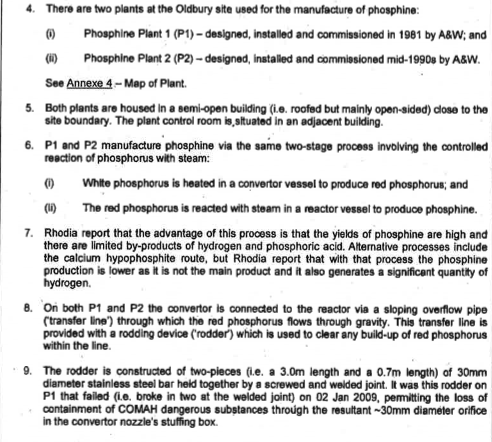 An inspection of the Trinity street site in June 1997 by the then newly formed Environment Agency reveals more detail as to how the two phosphine plants were at that time operating. 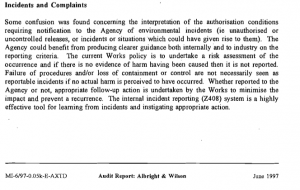 There is particular relevance as to how Albright and Wilson reported incidents based only on whether they judged that “harm” had occurred. 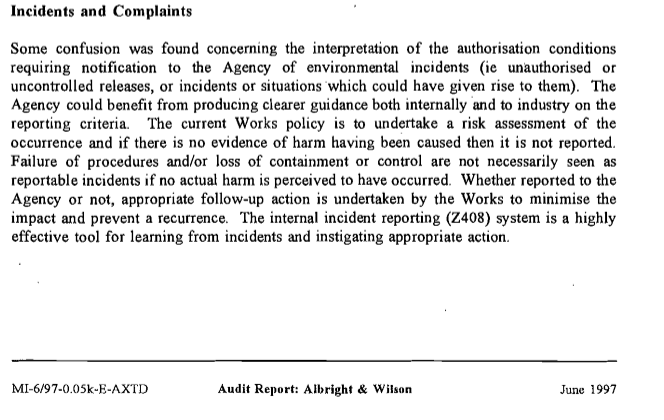 Quite how this operated when managers bonuses were linked to environmental incidents being low raises some serious questions that incidents were not reported. 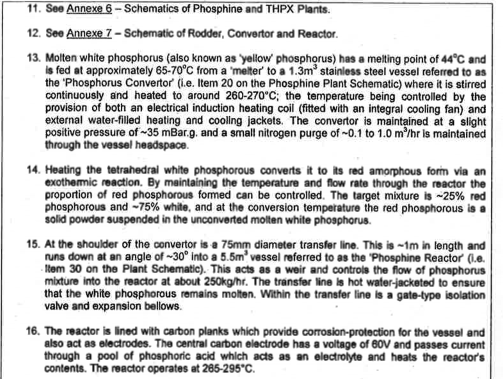 The two plants are described in this report. 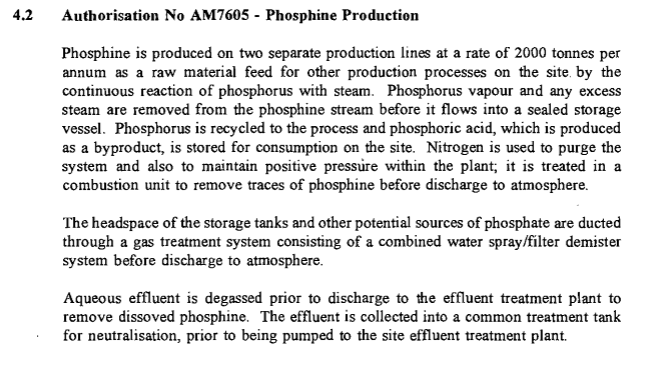 2000 tonnes per annum of phosphine is stated to be produced (AW figures). All of these procedures/inspections and new regulations and the much heralded “practice” alarms were an utter sham designed only to dupe the public into believing that they were “safe”. 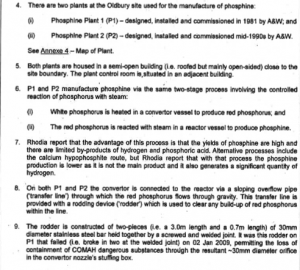 The HSE report into the 2009 uncontrolled release of phosphine from the failed number one plant is eye opening. 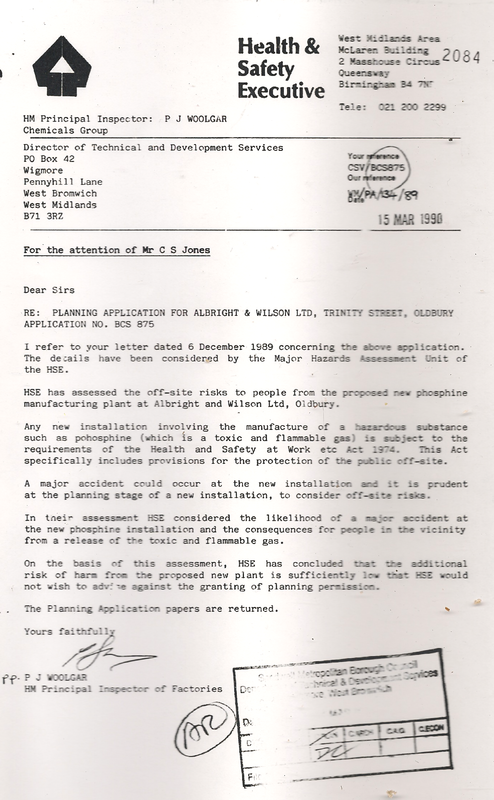 What is revealed is that the failure of this company is also the failure of the EA, The HSE, Sandwell council and just about everyone else to question what Albright and Wilson were actually doing in the set up of this failed plant. 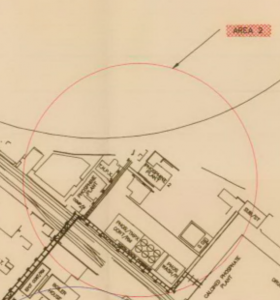 I will look at this in detail as it gives important information as to why. 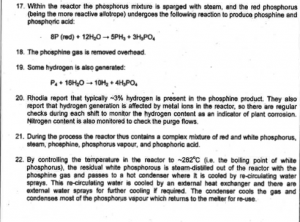 Initial paragraphs outline the cause of the incident and what occurred subsequently. 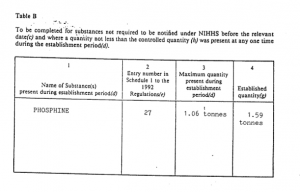 WHY DID THE HSE AND OTHERS NOT GET THE TECHINCAL INFORMATION WHEN THEY WAIVED THROUGH THE ORIGINAL APPLICATION? 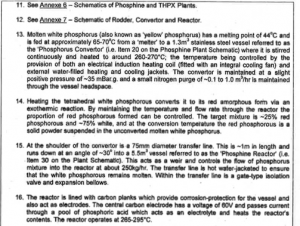 We are introduced to the technical workings of both plants with the terms “converter” , “reactor” and “rodder” proving crucial to the HSE’s investigation of the uncontrolled release of the toxic gas. 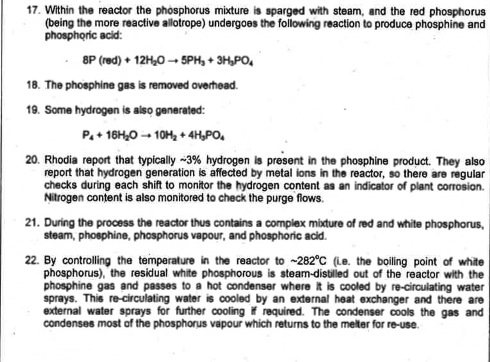 White phosphorus is added to the stainless steel converter. 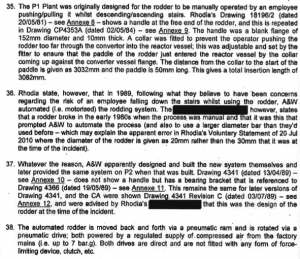 Subsequent paragraphs describe the rodder and its assembly. 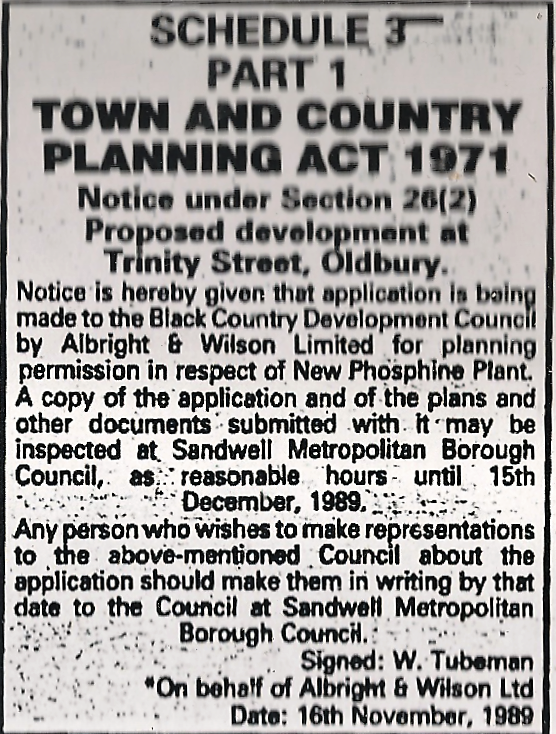 It is revealed that Albright and Wilson cut corners when their original design (ie the one approved by Sandwell council and the HSE without sufficient challenge), by automating the rodder instead of operating it manually. 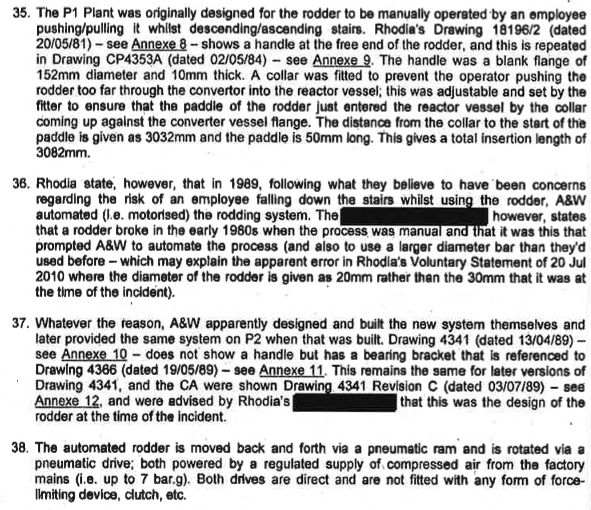 The statements made by Rhodia typically diverge as to why. 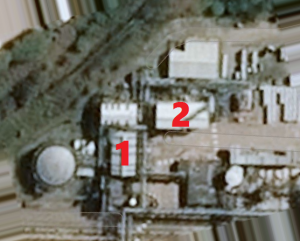 The failure was merely repeated when no one challenged the number two plant’s “similar” concept. AW adopted the cut and shut rodder, instead of using a one piece of metal. 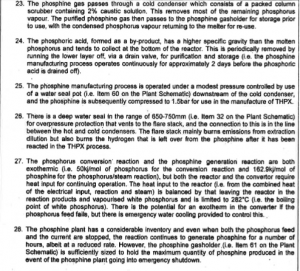 As with everything related to this company, their explanations of events when they are caught out stretch from the implausible to the bloody ridiculous. 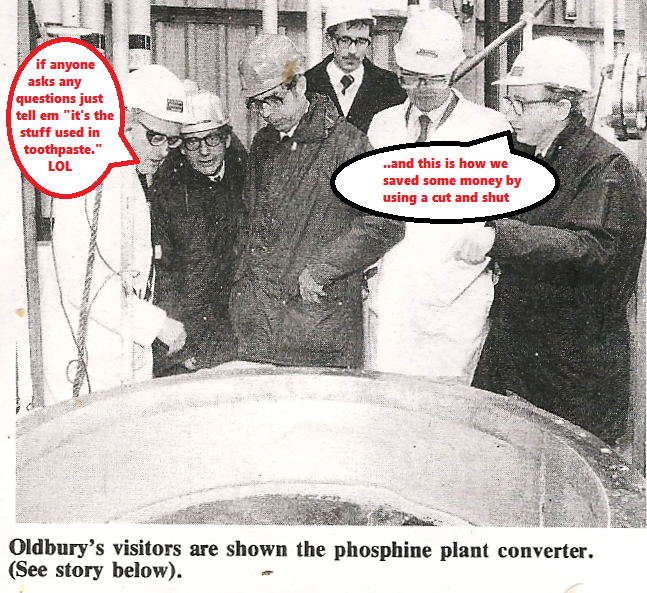 Below is another propaganda exercise of when the original plant was opened. 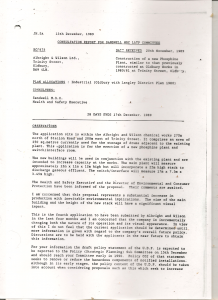 The honoured guests perhaps had the opportunity at the time to ask questions of AW about converters, reactors and rodders. One wonders what assurances they were given at the time.